Mmmm… chicken and spinach enchiladas. Doesn’t that just sound comforting and delicious? Oh yes, yes they are! These chicken and spinach enchiladas with creamy salsa verde salsa are “fast and easy”, “great for company” and “comfort food” all rolled into one. I started making enchiladas several years ago, back when I was trying to “fix” Mr. Crumbs peculiarities with food texture. He’s not a big fan of casseroles, since they tend to be uniformly orange and filled with “mystery” ingredients. But I love them myself. There’s something homey about a good ‘ol casserole, dontcha think? And I find them easy to make and comforting to eat. These enchiladas were my attempt at a compromise, and wouldn’t you know, it worked! If I remember correctly, the original recipe was from AllRecipes, but of course it’s been tailored to fit our own personal preferences over the years. We’ve added different vegetables, tried various tortillas and definitely kicked up the spice. When we switched to real food, I had to come up with a substitute for the canned cream of chicken soup. I could have made it from scratch, but that kinda defeated the purpose of “quick and easy” in my mind. These enchiladas are more of a dump, mix and bake type of meal, and I didn’t want to ruin the simplicity of that with having to make a batch of homemade cream of chicken soup first. Know what I mean? So I played with different ingredients and flavors and came up with a final combination that includes the addition of red onion, thanks to this delicious recipe by my sweet friend Diana, and have been deemed a family favorite. These enchiladas are just as delicious as the original, but much healthier and even more versatile. And made of real food. I firmly believe that every family needs a favorite enchilada recipe, so look no further if you don’t have one yet. Combine chicken, spinach, 2 Tbsp of taco seasoning, cumin, garlic powder and red onion in a large bowl. Season with pepper and taste. Add additional taco seasoning, if desired. Season with salt as needed. In a separate small bowl, combine sour cream and chili verde salsa. Taste, and season with salt, pepper, taco seasoning and/or cumin as desired. Smear approximately ¼ cup of the creamy salsa mixture all over the bottom of a 9x13 glass baking dish. Mix approximately ½ cup of the creamy salsa into the chicken and spinach mixture. Add more creamy salsa, 1 tablespoon at a time, if the mixture is dry. You want it to be a moist mixture, but not goopy and saturated. Measure ¼ cup of the chicken mixture into the center of a tortilla and roll up. Place tortilla at one end of the baking dish, seam down. Repeat with remaining tortillas and chicken mixture. Spread remaining creamy salsa mixture over the enchiladas. Sprinkle with shredded cheese and bake in the oven for about 20 minutes, or until the cheese is melted and slightly bubbly. *See substitution ideas for notes on the tortillas. Bonus! These are PERFECT for making ahead of time for busy nights. Make it through step 5, cover and keep it in the fridge. 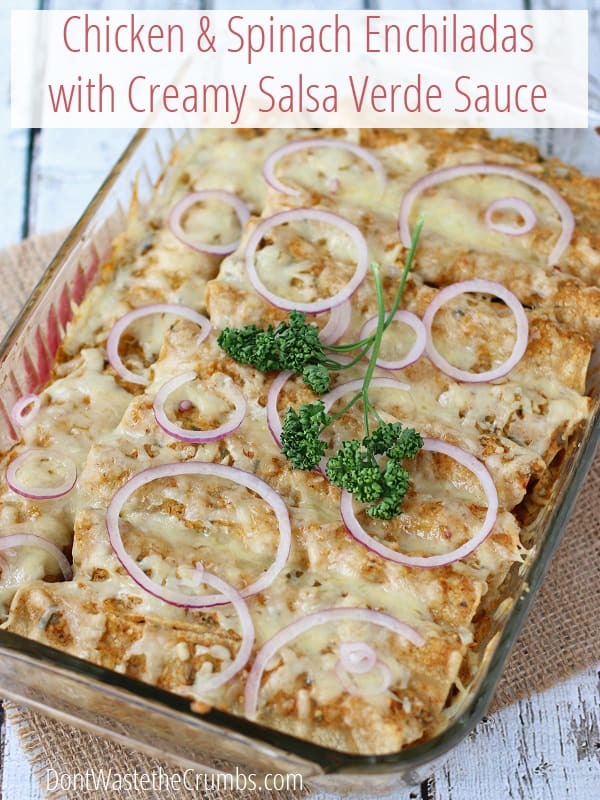 Then when it’s time for dinner, add the creamy salsa verde sauce and top with cheese and dinner will be ready in 15 minutes. Double Bonus! 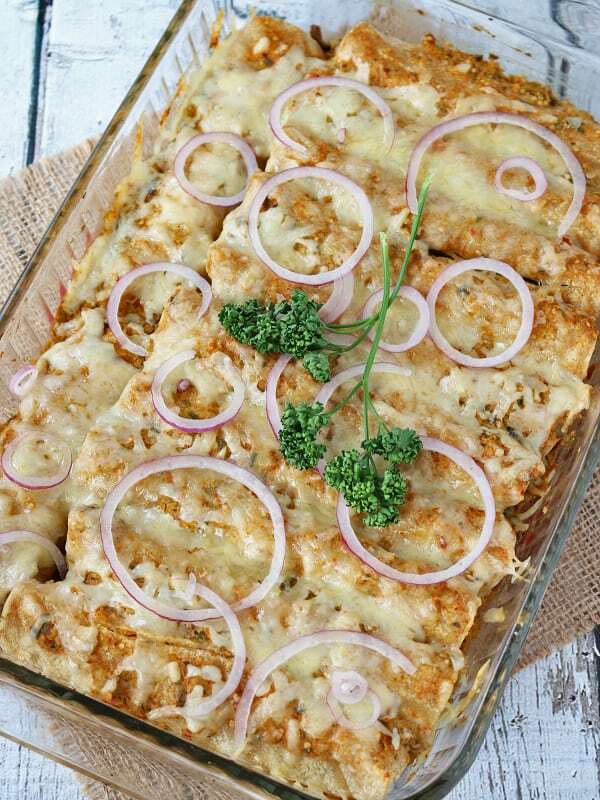 These chicken and spinach enchiladas are freezer-friendly! Make the entire recipe, sprinkle the cheese on top and freeze it in the dish. Go from freezer to oven, and add 20-30 minutes to the bake time. I honestly don’t measure the ingredients when I make this, but instead taste as I go. So feel free to adjust the seasonings to suit your preferences. If you have to choose, error on the high end of spice (i.e. taco seasoning, cumin, salt and pepper) and the low end of heat (i.e. cayenne and salsa flavor). You want those spices to permeate the entire dish, so season liberally. The heat, however, cuts through the dish easily, so use caution if you’re feeding those who don’t like it spicy. After I butcher a whole chicken into parts and make chicken stock, I freeze the cooked meat into one cup portions. This makes it REALLY easy to pull out one or two bags, along with spinach, and thaw for dinner. Plus it allows me to save the chicken parts (i.e. breasts, thighs and drumsticks) for meals that call for whole pieces rather than shredded chicken. More ideas on how to stretch a whole chicken into several meals! There are various stopping points along the way to help you make this recipe ahead of time. You can mix the chicken, spinach and sauce and stop there; OR you can go ahead and fill and roll the tortillas and stop there. Whichever suits your fancy, and your schedule. Personally, I pull the chicken and spinach the night before to thaw. The next morning I’ll whip up the sauce and combine with the chicken and spinach just after breakfast to make the dinner process run a bit smoother. Then I’ll roll it all up just before baking, which makes the total time of afternoon dinner prep (including baking) less than 30 minutes. This means very little time prepping these chicken and spinach enchiladas. Using red salsa in place of salsa verde (green salsa) is delicious too, but make sure it’s thick, or strain a thinner salsa before using. Note that this will slightly change the flavor. Salsa verde is usually spicier with a lemony tang. Red salsa will have that underlying tomato flavor. Both really good though. 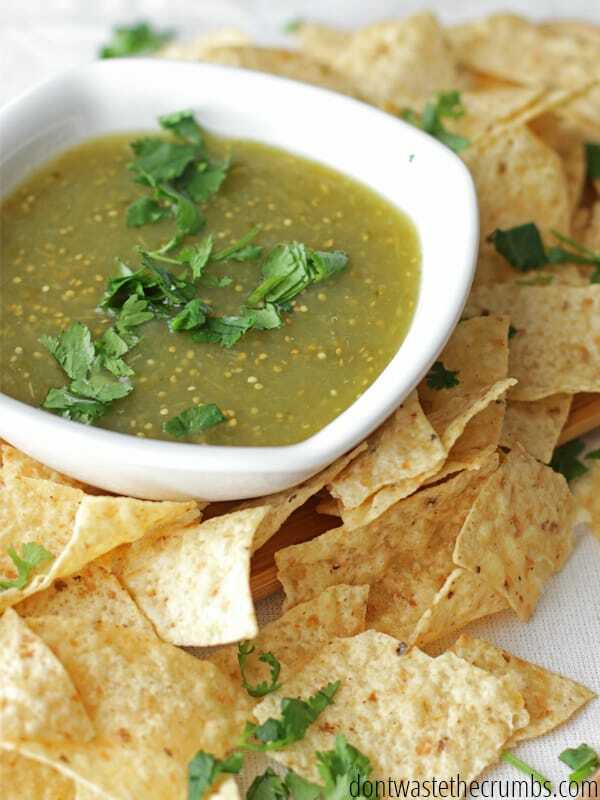 Here’s our favorite homemade salsa recipe. You can substitute sour cream for the Greek yogurt without any other modifications. You can also swap regular yogurt (make it homemade) for Greek yogurt (make this homemade too), but you might have to adjust how much you use in order to keep that thick, creamy enchilada sauce texture. 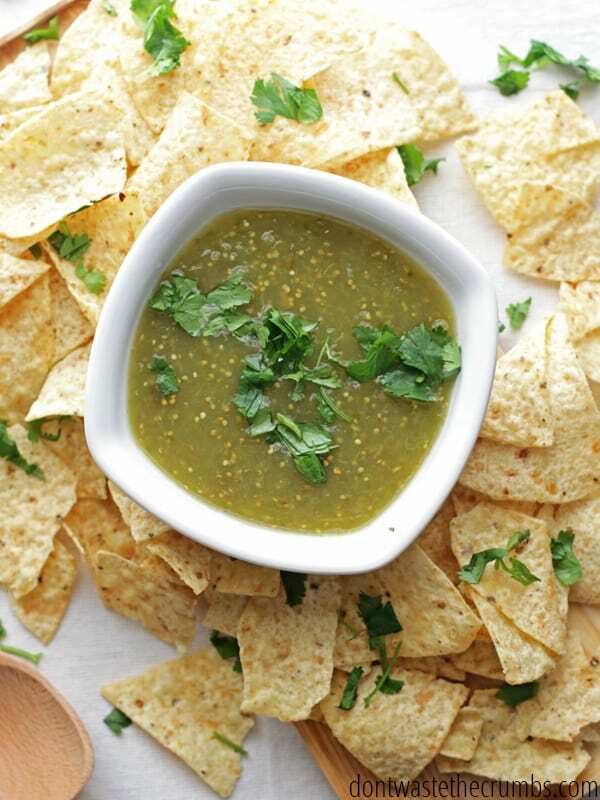 Using a thick salsa, like the homemade salsa verde recipe below, is best when using regular yogurt. You can use any tortillas you want, so long as they’re delicious on their own. We prefer homemade corn or homemade flour tortillas best. In the past, we’ve tried Tortilla Land’s ready-to-cook flour tortillas (in the refrigerated section) and those turned out well (cook them first, then follow the recipe) and aren’t a bad option if making homemade flour tortillas just isn’t in the cards. Most recently we tried this with store-bought corn tortillas that weren’t very good on their own, so I don’t recommend doing that unless you’ve found a brand that you really like. If you’re able to find fresh tomatillo’s in the store or market, pick up a pound and give this recipe a try. It’s SO easy to make, and not only goes great in the enchilada recipe above, but we use it in tortilla soup too. So good!! On a large baking sheet lined with aluminum foil, combine tomatillo's, jalapenos, garlic and white onion. Drizzle with olive oil and season and pepper. Roast in the oven for 45 minutes, or until the vegetables are just beginning to blister. Allow to cool to room temperature. Combine vegetables and cilantro in a blender. Pulse until vegetables are roughly chopped. Taste and season with additional salt and sugar as needed. This salsa is very thick freshly made, and thickens in the refrigerator as well. I suggest thinning with ¼ cup of water immediately. Then, thin as desired using additional water. You don’t HAVE to roast the vegetables first if you’re short on time. Simply puree it all in a blender or food processor and call it done. 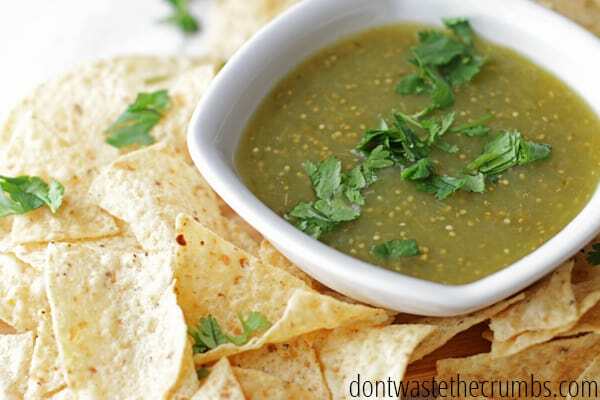 Tomatillo’s have a very bright flavor, so expect that to be prevalent if you go raw. Roasting the vegetables first imparts that slightly smoky/sweet flavor that is just so good! Since finding fresh tomatillo’s is a hit or miss thing, I’m using the price of salsa verde from Trader Joe’s for the cost breakdown. Using a full two cups of chicken and a full cup of cheese is our favorite way of making this, but I’ve cut both of these in half before and dinner was still really good. If you’re able to find fresh tomatillo’s and cut back on the chicken and cheese, you can make this for just over $6. Let’s talk chicken and spinach enchiladas… do you have a favorite flavor combination? I’d love to hear your creative ideas in the comments! I made this last night (subbing turkey for the chicken and a homemade red salsa because it’s what I had) and the entire pan was devoured. I knew my family liked enchiladas, but I have never had a whole pan devoured. Even the 4 year old ate TWO – including the spinach! This is definitely a “keeper” recipe and will be made again…only a double batch will be made since I rely on leftovers for lunch the next day. Thank you for the recipe. I am a sucker for Mexican any day, but I bet this woudl be spicy for me. Thanks for posting, I shared this on my May real food meal plan. I just made this a few days ago, and my husband is already asking me to make it again. These are probably the best enchiladas we’ve ever had! The recipe definitely would not have been the same without the homemade chili verde salsa. I’ve never done well with very spicy food, but this recipe has just the right amount of spice and such a good flavor. This is definitely a keeper! 🙂 Thanks for the recipe. It’s very possible Kelsey! I’ve made this with corn and flour, and flour tortillas in general seem to hold much much better long-term than corn. I’m sure it’ll be messy, but still delicious as you said! This recipe looks so good! My freezer safe glass Tupperware says not to go from freezer to oven… will thawing before baking work for this recipe, or is going from freezer to oven important? You can thaw before baking for sure Keely!